Mauricio is currently visiting Armidale from Santos, a city on the central coast in Sao Paulo Estate, Brazil. As well as being able to boast the largest harbour in Latin America, Santos is the home of one of the most famous soccer teams in Brazil- the Santos Football Club. In fact, Pelé, who is the greatest football player of all time, played with Santos Football Club for 18 years. Santos is also notable as the first person, Jose Bonifacio de Andrada e Silva, who studied environmental issues in Brazil, came from this city. Jose is also commonly referred to as the Patriarch of Brazilian Independence. Whilst I was speaking to Mauricio he explained how Brazil compared to Australia. First of all, the population of Brazil is 200 million people as opposed to Australia’s population of 24 million people. Mauricio also noted there was a much bigger gap between the rich and the poor in Brazil. As you can imagine this disparity creates a number of social problems for the country. Just like Australia, some of the most popular activities in Brazil are going to the beach and playing sport- especially soccer. The other sport that is getting more popular each year in Brazil is surfing. In the last four years, Brazil got more titles than Australia, Hawaii and USA combined, in world competitions. Mauricio first started surfing when he was just 10 years old. Apparently Mauricio’s older brother Adilson got him hooked on the water sport. As he got older, Mauricio’s love of surfing ignited his interest in protecting the environment. 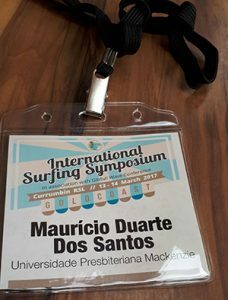 When Mauricio enrolled in a PhD at Mackenzie Presbyterian University Sao Paulo (which has an academic agreement with UNE), he decided to focus on legal issues relating to surfing reserves. 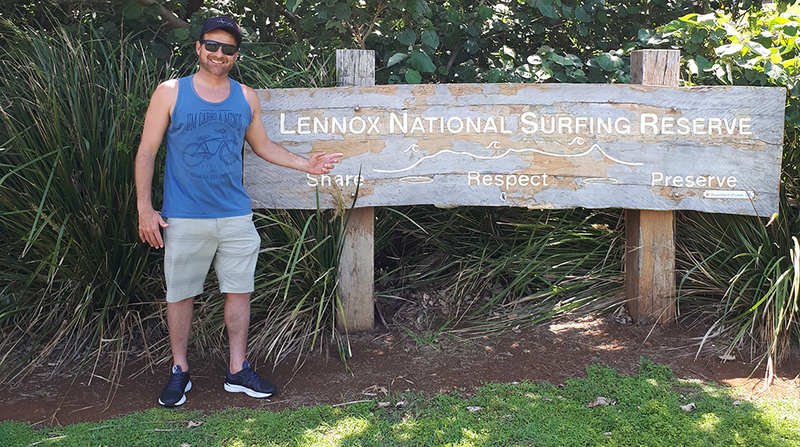 For those of you who don’t know, a surfing reserve is an area which has intrinsic environmental significance to both surfers and the community at large. Some surfers know their sport, lifestyle and in some cases livelihood, depends on having a pristine environment in which to surf. This has led to a surfing culture which focuses on protecting the environment- especially around important surfing areas. This awareness means the current generation of surfers have chosen to get more involved with protecting surfing areas for their children and subsequent generations. Apparently Australia and New Zealand were some of the first countries to establish legal protections in terms of surfing reserves. 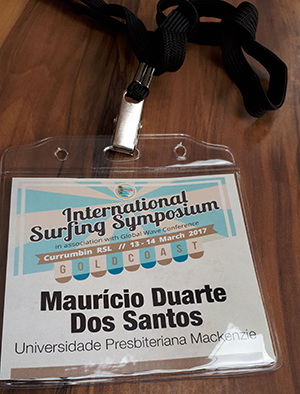 Surfing reserves are also becoming prominent in countries such as the United States and Latin American Countries such as Brazil, Peru and Puerto Rico. This is generally as a result of the initiatives of NGOs. So you may be thinking- why would Mauricio chose to visit inland Armidale when completing a PhD relating to surfing reserves as environmental protected areas? Well the answer is, to gain access to some of the world’s best environmental academic lawyers from the UNE School of Law’s Ag Law Centre. For example, Mauricio notes that Professor Paul Martin is one of the most important academic lawyers in environmental issues in the world. In particular, Paul is helping Mauricio with governance and environmental methodology issues relating to his PhD topic. This is not the first time Mauricio has visited Australia. In fact, he lived here during 2006 and 2007. Since then he has visited ‘down under’ on a number of occasions. During these visits he presented a paper at the IUCN colloquium (academic of environmental law) which was hosted by Waikato University and UNE in New Zealand in July 2013. He also presented a paper regarding his PhD topic at a symposium in the Gold Coast in March this year. When Mauricio arrived in Australia in 2006, he could not speak a word of English. He needed to learn English though, as having proficiency in English is an entry requirement to undertaking a master’s degree in Brazil. Mauricio quickly came to love Australia and now describes it as his favourite country in the world! Mauricio works as a solicitor and academic in Brazil. He has practised in a number of areas of law including contract, torts and environmental law. When working as an academic, he teaches environmental law, constitutional law and Maritime/law of the sea. Brazil has a very different legal system to Australia as the Brazilian system is based on civil law as opposed to common law. The civil system relies mainly on codified statutes, whereas case law is more important in common law countries. Mauricio is enjoying living in Armidale. He really likes the UNE campus, and often visits the UNE Sports Union where he undertakes classes in yoga, body balance and boxing. Mauricio has also become friends with a number of other international students whilst visiting the UNE School of Law. Very soon, Dr Carolina Dutra, Mauricio’s fiancée, will be arriving from Brazil. The couple have plans to travel around the Australian coast and New Zealand. Mauricio is also very appreciative to the Brazilian Federal Agency for Support and Evaluation of Graduate Education-CAPES by providing him with a PhD scholarship. In addition, he would like to personally thank UNE for offering him a place to study and work in Australia. We are very pleased to have you Mauricio!